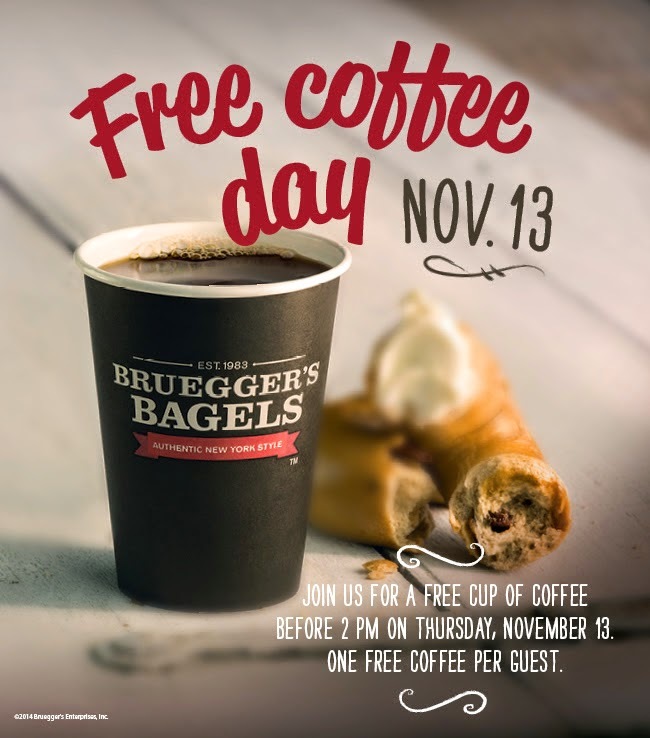 Bruegger’s Bagels kicks off the 12th season of its guest-favorite Bottomless Mug program and will celebrate with Free Coffee Day on Thursday, November 13, 2014. Guests who visit the bakery on November 13th from opening until 2 p.m. can get a free medium coffee (one per guest), no coupon or purchase required. Guests who buy a Bottomless Mug can refill it as frequently as they want with coffee, tea or soda at no additional charge every time they visit a participating Bruegger’s Bagels through the end of 2015 – potentially saving more than $300 over the course of the year. “Free Coffee Day is our way of kicking off this popular program and thanking our guests for choosing Bruegger’s Bagels as a place to visit time and again,” said Judy Kadylak, vice president of marketing for Bruegger’s Bagels. Bottomless Mugs can be refilled with the guest’s choice of beverages that can be enjoyed with fresh, authentic, New York-style bagels with 100 percent made-in-Vermont cream cheese, breakfast sandwiches, Signature Bagel Sandwiches, hot panini, new Bagel Burgers, Signature Soups and salads. 2015 Bottomless Mugs can be purchased through the end of January for use throughout next year at nearly all of Bruegger’s Bagels bakeries nationwide. 2014 Bottomless Mugs are still active through December 31st.